George Zimmerman is appealing a court ruling that NBC did not defame him in airing an edited 911 call made before his scuffle with Trayvon Martin. Records from the Seminole County Clerk of Courts show a notice of appeal in the civil case, dated Tuesday, July 22. In 2012, this judge was assigned to the State vs Zimmerman trial but recused herself from the case to avoid a conflict. As anticipated by, well, everybody, George Zimmerman’s civil lawyer, James Beasley Jr., has filed an appeal with Florida’s Fifth District Court of Appeals (5th DCA) of the dismissal by June Debra Nelson of Zimmerman’s defamation suit against NBC broadcasting. This is per reports by Orlando’s WKMG and the Orlando Sentinel. We previously covered Judge Nelson’s dismissal of the suit here at Legal Insurrection, Zimmerman Libel Suit Against NBC Thrown Out, including the full text of her order. The basis of the defamation claim is that NBC made Zimmerman appear racist by doctoring a 911 recording so as to make it appear that Zimmerman made an unsolicited identification of Trayvon Martin’s race. In fact, Zimmerman was explicitly asked about Martin’s race by the police dispatcher, thus triggering his observation that “he looks black.” It is this explicit dispatcher request which was cut out of the doctored version of the recording aired repeatedly by NBC. In the event, no evidence of racism was found despite dozens of FBI interviews made of Zimmerman’s friends and neighbors, including an ex-fiance with whom Zimmerman had previous legal difficulties and presumably had no interest in lying in his favor. Indeed several of Zimmerman’s neighbors and acquaintances appeared in court–as State witnesses!–and testified favorably about his character. Dr. Shiping Bao was the medical examiner who did the autopsy on Trayvon Martin’s body, and he was one of the state’s main expert witnesses at last year’s George Zimmerman trial. The Seminole/Volusia County Medical Examiner’s office fired Dr. Bao one month after the trial. Now, in a new 37-page book, called “Dead Men Can’t Lie,” Dr. Bao said he wants to set the record straight. He claims Sanford Police didn’t properly preserve evidence. Zimmerman’s defense attorney Don West asked him about that during the trial, to create reasonable doubt in the jurors’ minds. News 13 Legal Analyst Mark NeJame says Bao’s testimony actually helped the defense. “It was some of the worst testimony I’ve ever seen in my 30-plus years as a trial attorney,” said NeJame, with NeJame Law. Dr. Bao said he has been questioned this summer by the U.S. Department of Justice in their investigation into whether George Zimmerman violated Trayvon Martin’s civil rights when he shot Martin in February 2012. But Bao said that’s not a question he’s qualified to answer. Attorney General Eric Holder acknowledged Thursday that even as his department has been opening new investigations stemming from the racially-charged shooting death of African-American teenager Michael Brown in Ferguson, Mo. last month, federal prosecutors have still not concluded a long-pending probe into the shooting death of another black teen, Trayvon Martin, in Florida in 2012. Last November, Holder told the Washington Post he expected a conclusion "relatively soon" to the probe into the shooting of Martin by neighborhood watch volunteer George Zimmerman. In July 2013, a Florida jury acquitted Zimmerman was acquitted of murder. Holder promptly announced that the Justice Department would probe the case to see if prosecution on federal charges was warranted. But at a press conference Thursday to announce a broadening of federal inquiries into police activities in Ferguson, Holder said the Florida case remained under active investigation nearly ten months after he said it was concluding. In his latest comments, the attorney general did not predict when the Zimmerman-Martin probe might conclude. "That matter is ongoing. There are active steps that we are still in the process of taking," Holder told journalists. "There are witnesses who we want to speak to as a result of some recent developments.... that matter is still underway." Holder did not say what "recent developments" prosecutors were exploring, but Zimmerman has had several brushes with the law since the shooting two years ago. The Justice Department is not expected to bring civil rights charges against George Zimmerman in the 2012 shooting death of Trayvon Martin, according to three law enforcement officials, despite allegations that the killing was racially motivated. A federal grand jury will meet in downtown Orlando Wednesday to hear testimony about whether Trayvon Martin's civil rights were violated when Neighborhood Watch volunteer George Zimmerman shot him in the chest, according to court paperwork..
A U.S. Department of Justice attorney from Washington, D.C., Mark Blumberg, has issued at least one subpoena for Wednesday in the case. Blumberg would not comment on the grand jury session, but the federal panel is to meet at 9 a.m. at the federal courts building on Central Avenue in downtown Orlando to hear evidence in the case. It's not clear how many witnesses have been ordered to appear, but at least one, Frank Taaffe, Zimmerman's former neighbor and longtime defender, has been. Following Zimmerman's acquittal on a murder charge, Taaffe has reversed his position and now says that he believes Zimmerman was motivated by race the night he followed then shot Trayvon in 2012. Last month, the Washington Post cited three unnamed law enforcement officials as saying there would likely be no federal charges brought against Zimmerman because of insufficient evidence. An Orlando federal grand jury was in session Wednesday but there was no indication during its morning session that it heard evidence in the George Zimmerman civil rights case..
A Department of Justice civil rights attorney from Washington, D.C., Mark Blumberg, subpoenaed at least one person to appear at 9 a.m. Wednesday in that case: Frank Taaffe, Zimmerman's former neighbor and until a few months ago, his defender. But Taaffe did not appear in the public portions of the Orlando federal courts building Wednesday morning, and he did not exit the hallway used by the grand jury when it took a break about 11:30 a.m. Neither did anyone else known to have ties to Zimmerman or Trayvon Martin, the 17-year-old black teenager he killed Feb. 26, 2012, in Sanford. Once George Zimmerman's vocal defender, Frank Taaffe said Wednesday that he wanted to "make amends" with the family of Trayvon Martin by testifying for a federal grand jury convened in downtown Orlando..
Taaffe said he expected to testify about a phone call days before Zimmerman's arrest from someone who claimed to be Zimmerman and made a "racial comment" about the case, Taaffe said. He said the call came from an unknown number, so he couldn't be 100 percent sure it was Zimmerman. Taaffe said FBI agents also have asked him about comments he made while Zimmerman's jury was deliberating. Taaffe claimed to have been tipped off about the jury's discussions, which are supposed to be secret. The Washington Post recently reported federal charges against Zimmerman are unlikely. Pressed on his motivation to testify, Taaffe said he has a daughter in the U.S. Marine Corps who was ostracized due to his role as Zimmerman's primary supporter. It damaged their relationship, he said. "I miss her and I love her," said Taaffe, who wore photos of his deceased sons on a lanyard around his neck. "She's my only child I've got left." Friend and former neighbor Frank Taaffe is testifying against George Zimmerman before a grand jury that will decide if Zimmerman is guilty of violating Trayvon Marton’s civil rights. Despite once defending him on national TV, Taaffe now believes that Zimmerman went after teenage Martin because he was black. According to the Orlando Sentinel, Frank alleges that a man claiming to be George Zimmerman called him and told him a “racial comment” that was disparaging to Travon Martin before being arrested for the shooting. The former neighbor wouldn’t disclose exactly what the man said outside the courtroom other than it was racist. He didn’t testify in the earlier court case where Zimmerman was acquitted of second-degree murder charges, believing that the call was just a prank. George Zimmerman has been arrested in Seminole County. A representative for the Seminole County Sheriff's Office tells Local 6 Zimmerman was booked into the jail around 10 p.m. Friday on a charge of aggravated assault with a deadly weapon. The incident apparently occurred several days ago at a home in Lake Mary. 8:33 AM PST -- Zimmerman just appeared in court, and now we know he was arrested for allegedly throwing a wine bottle at his girlfriend. He's been ordered to surrender all firearms and bond was set at $5K. And get this ... Zimmerman laughed and joked with a bailiff as he signed court docs. 31 year old George Zimmerman finds himself in trouble with the law again, this time he was arrested and booked Friday night for aggravated assault and domestic violence with a weapon in Lake Mary, Florida. A Seminole County judge set Zimmerman’s bond at $5,000, prohibited him from any contact with the victim, returning to her home or entering Volusia County and must surrender all fire arms. What are the odds that Zimmerman will abide by the court’s order? Following his acquittal in the death of Trayvon Martin in 2013, Zimmerman seems to not be able to stay out of trouble. George Zimmerman is due back in court at 1:30 p.m. February 17, 2015 in front of Judge Donna McIntosh. Police have released new information on George Zimmerman's arrest for aggravated assault Friday night after he allegedly threw a wine bottle at his girlfriend days earlier. Zimmerman, who was acquitted in 2013 in the shooting death of 17-year-old Trayvon Martin that got worldwide attention, bonded out of the Seminole County Jail on Saturday. According to an arrest report released Monday by Lake Mary police, the incident happened on Jan. 5. Officers on patrol that night near Zimmerman's parents' home heard glass break, and then saw a vehicle drive away from the home without its headlights turned on. After officers stopped the vehicle, they said the driver told them Zimmerman had just thrown a glass wine bottle at her, broke her cell phone and made threatening comments. The unidentified woman told police she had been living with Zimmerman for the last few months, and they had been in an intimate relationship. Police said the woman added she did not wish to be involved in their investigation, and stated she was only Zimmerman's roommate. Police said they found the broken wine bottle in the driveway of the home, and made multiple attempts to contact Zimmerman at the residence and by phone. It wasn't until four days later, on Friday, that police successfully made contact with Zimmerman, who agreed to speak with officers while his attorney, Don West, listened in over the phone. Zimmerman told police he was in a romantic relationship with the victim, but claimed she threw the wine bottle at him. Pattern of blaming the victim. 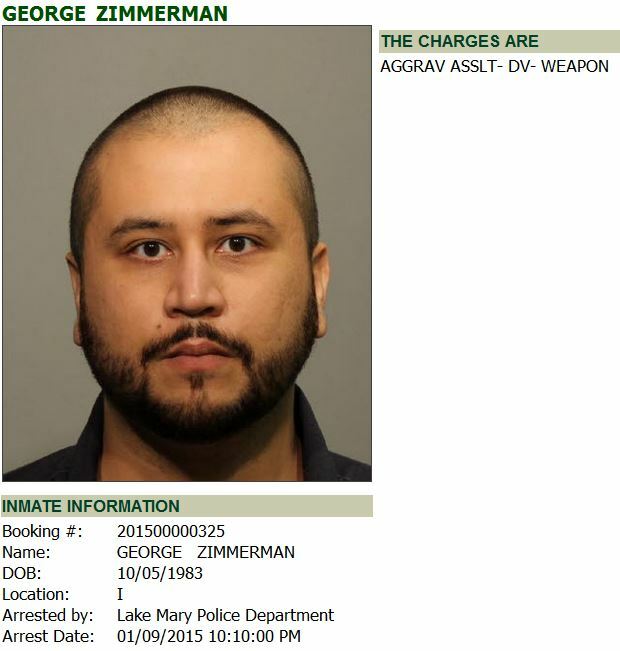 George Zimmerman surrendered his firearms per a judge's orders after his arrest Friday for aggravated assault. A Seminole County judge gave Zimmerman until Tuesday to turn in his guns as a condition of his release on bond. We checked earlier Tuesday with his attorney, Don West, who said Zimmerman surrendered his firearms to him on Saturday, shortly after his release. West said he then gave the guns to a third party for safe keeping. LAKE MARY, Fla. (WOFL FOX 35 ORLANDO) - State Attorney Phil Archer announced Friday that his office will not file formal charges against George Zimmerman in connection with his arrest Jan. 9th for suspicion of aggravated assault in Lake Mary. The office says it completed a review of the initial Lake Mary Police Department arrest report as well as additional written and oral statements submitted by the alleged victim after the arrest as part of the ongoing investigation. "While it is clear that the officers had probable cause to arrest Mr. Zimmerman which was affirmed by the circuit court judge at initial appearances, the subsequent recantation by the victim of her initial statement along with new documents provided by the victim and her attorney precludes my office from proceeding further," Archer said. The State Attorney's Office noted that the interview and documents provided by the victim were the result of a subpoena served on her requiring her appearance due to the fact that the victim refused to attend the first scheduled meeting with the office. The victim denied that Mr. Zimmerman threw a bottle at her and stated that she was never in fear of the Defendant. She also made it clear that she did not want to proceed with the case. A lack of eyewitnesses or other corroborating evidence to dispute her version of the incident also contributed to the decision. The Department of Justice will reportedly announce that it will not bring federal civil rights charges against George Zimmerman over Zimmerman’s self-defense killing of Trayvon Martin, reports ABC News. This decision comes as no surprise to anyone familiar with the actual facts of the case. Zimmerman’s claim of lawful self-defense was overwhelmingly supported by evidence presented at trial, and there was no additional evidence suggesting Zimmerman had set out to deliberately violate Martin’s civil rights. Indeed, the only shocking aspect of this is that it took the Department of Justice 19 months after Zimmerman’s acquittal to make the announcement. Given the Obama Administration’s incessant spinning of the news cycle so as to avoid getting pinned down to any single particular scandal, it seems likely that the announcement will be timed to coincide with the three year anniversary (February 26, two days from today) of Martin’s death. Soon after the 2012 shooting, the Department of Justice ordered a team of FBI agents to interview witnesses, neighbors, co-workers, and friends of Zimmerman in a search for any evidence of racism. They didn’t just come up empty; what evidence they did find confirmed that Zimmerman was decidedly not racist. Page created in 4.803 seconds with 20 queries.